The exhibition «Etruschi. Maestri di Scrittura» ( Etruscans. Masters of Writing) was inaugurated last Friday, March 18th in Cortona at the Etruscan Academy Museum of the City of Cortona (MAEC) and it will be open until July 31st 2016. After the recent discoveries of Etruscan inscriptions near Montpellier and the discovery in Cortona of the third longest existing Etruscan text (the so-called "Tabula Cortonensis"), the Louvre Museum, the Museum Henri Prades Lattes and MAEC Cortona have designed this great event, exposing some of the artifacts that have allowed us to make significant advances in the knowledge of the language of the Etruscans and their writing techniques. The exhibition aims to point out all these aspects, showing the progress of the studies in syntax and grammar, through new submission of multiple inscriptions, some of which are completely new. One of the works on display that excites the public's attention is undoubtedly the "Zagreb Mummy", manuscript, the longest Etruscan text in the world. The only surviving evidence of this kind had probably belonged to an Etruscan soothsayer and was found by chance when, towards the first half of the nineteenth century, the Croatian noble Mihail de Brariae brought home a mummy from a trip to Egypt, bought by local merchants. In 1892 the Egyptologist Brugsch saw that the linen bandages that were wrapped around were actually an ancient Etruscan text reused by Egyptian embalmers perhaps for lack of material. The book consists of columns that contain 34 lines of writing for a total of 230 lines, a width of about 24 cm., and about 1350 words in total which of course are not all translatable, for the damage caused by the wear of time, from misuse and partly because some terms are still completely unknown to us today. It is important to remember that this is the first time that this priceless object is exposed in Italy, a great deal for the town of Cortona and the MAEC. 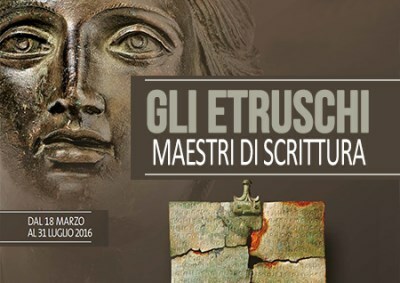 If you do not want to miss a visit to the exhibition «Etruschi. Maestri di Scrittura» and to the beautiful Etruscan town of Cortona, you can choose to book one of our villas and apartments with pool in this amazing area of Tuscany.